Northwest of San Cristóbal de las Casas lie the two Tzotzil-speaking villages of San Juan Chamula and San Lorenzo Zinacantan. They have very different religious practices and customs. Chamulan women wear black "hairy" wool skirts with colorful blouses, the men wear black or white wool tunics. 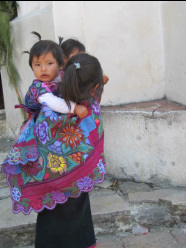 Women from Zinacantan wear black embroidered skirts with capes. 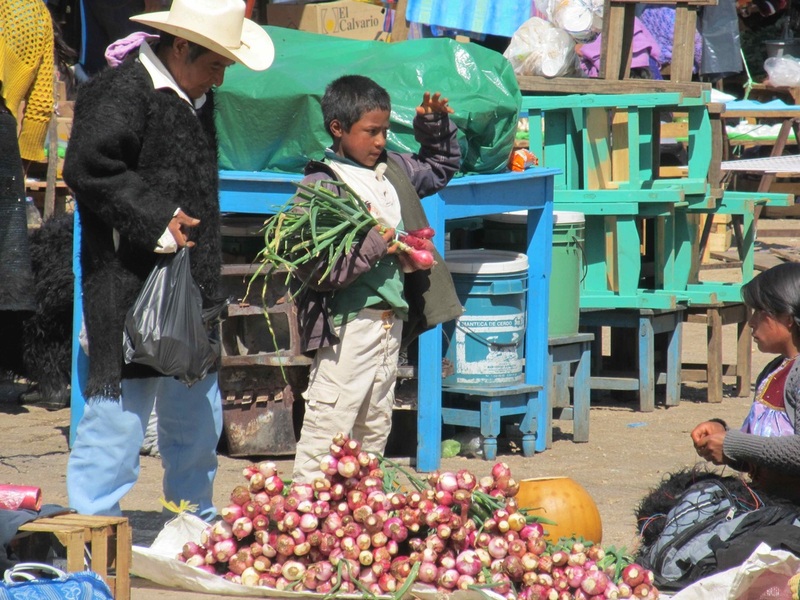 Chamula is famous for sheep,wool, and vegetables, while people in Zinacantan grow flowers in huge greenhouses, supplying most of southern Mexico. 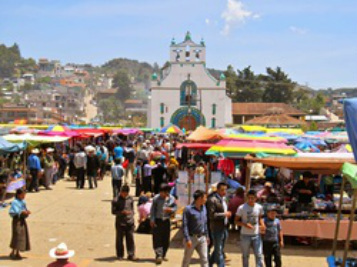 In Chamula on Fridays, visitors can witness healing ceremonies in the church that involve candles, alcohol, CocaCola, and sometimes chickens. 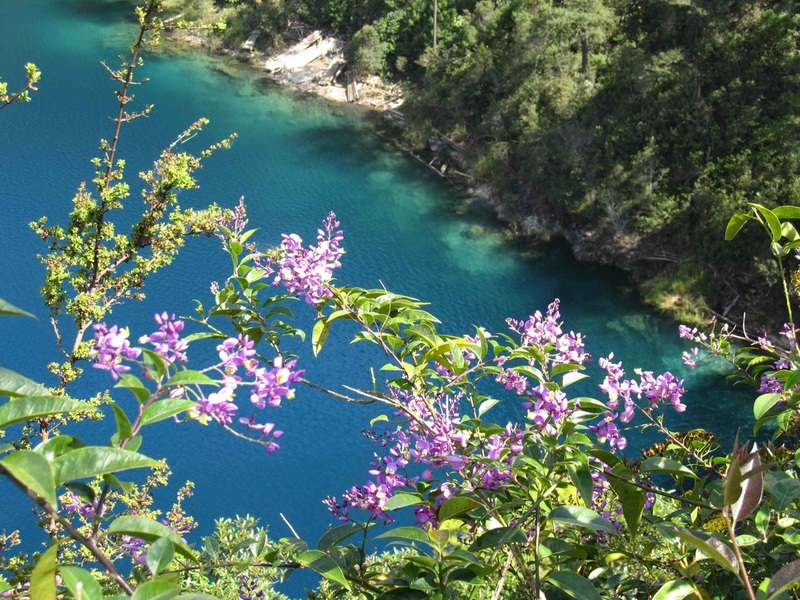 Several dozen beautiful lakes dot the rain forest in southern Chiapas in a National Park called Lagunas de Montebello. 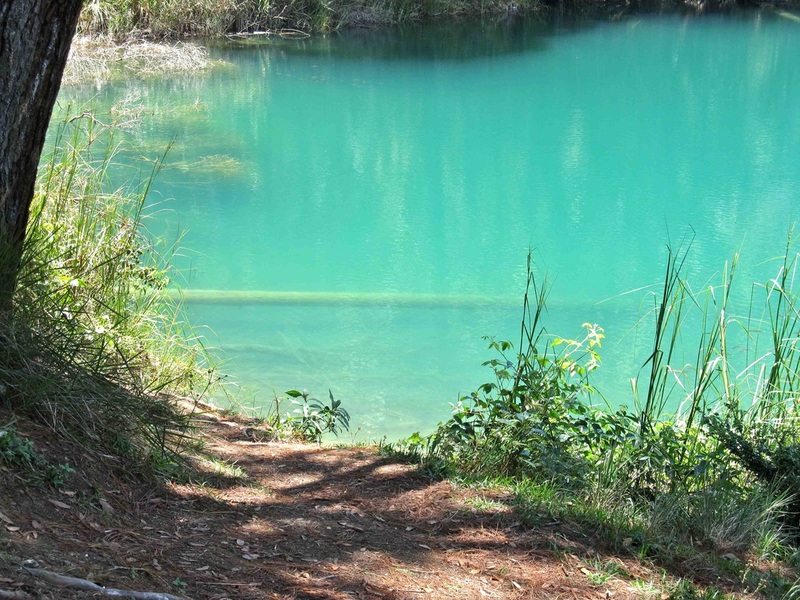 Each lake has its own unique color, caused by minerals in the springs that feed them. Some lakes have boats and kayaks for rent. 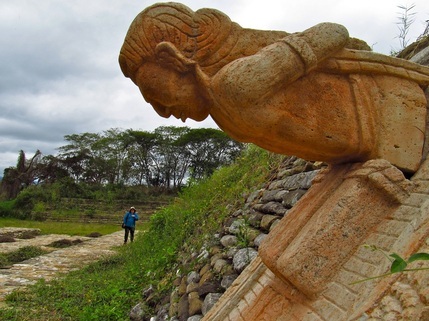 Toniná is the Mayan city-state that took down powerful Palenque in 850 AD. It has a well-preserved ball court where the players were beheaded after the game on a small pyramid still standing nearby. The story behind the ballgame is a fascinating blend of myth, politics, religion, and connection with the natural world. Visitors are allowed to climb to the highest point in the pyramid complex for wide vistas of the Ocosingo Valley. The on-site museum has many fine pieces of Mayan art, including a sculpture of the God of Chocolate. 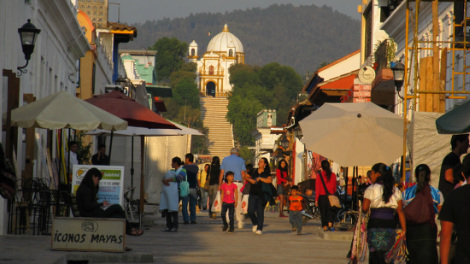 Three streets in the city of San Cristóbal de las Casas have been permanently blocked off to car traffic. They are the "andadors", walking streets. Along them can be found numerous restaurants, shops, specialty stores, and hotels with all the services a traveler needs. Women from nearby villages, in their native costumes, wander the streets selling textiles, belts, and jewelry. On nice days the cafes put out tables where you can enjoy an excellent cup of coffee grown in the nearby mountains and roasted right in town. 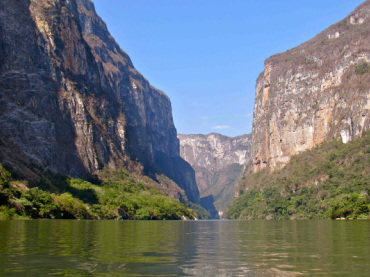 These cliffs are featured in the emblem of the state of Chiapas. The canyon walls rise as much as 1000 meters (3000+ feet) from the surface of the water. 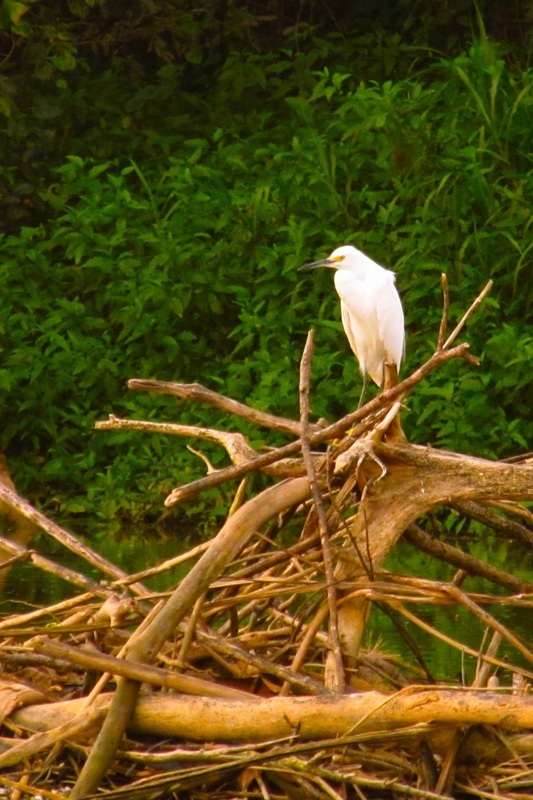 Along the shallower edges, crocodiles can be seen basking in the sun, monkeys live in the trees, and many species of birds can be observed fishing, flying and sunning themselves on the river banks. 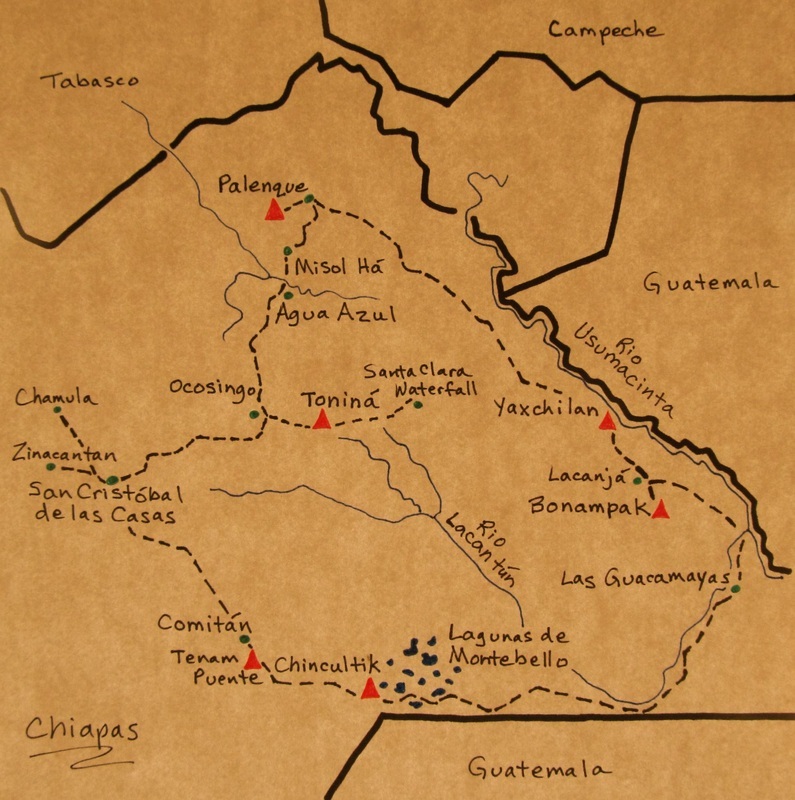 The Grijalva river originates in the highlands of Guatemala and flows through Chiapas to the Gulf of Mexico. Along its course four major dams supply most of the electricity in southern Mexico. 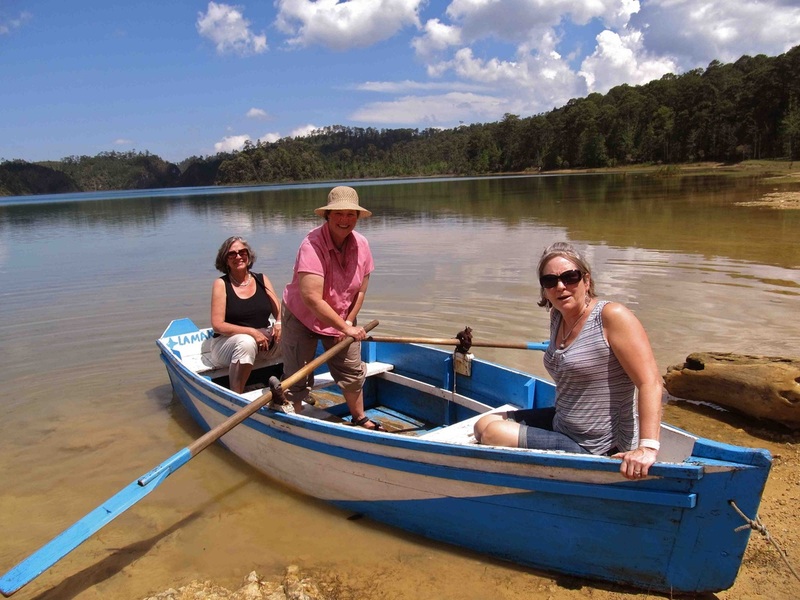 The boat tour of the canyon turns around at the Chicoasen dam and returns to Chiapa de Corzo. We visit this canyon on the 2-week tour. Chiapas receives more than a hundred inches of rain a year, and in some places twice that. 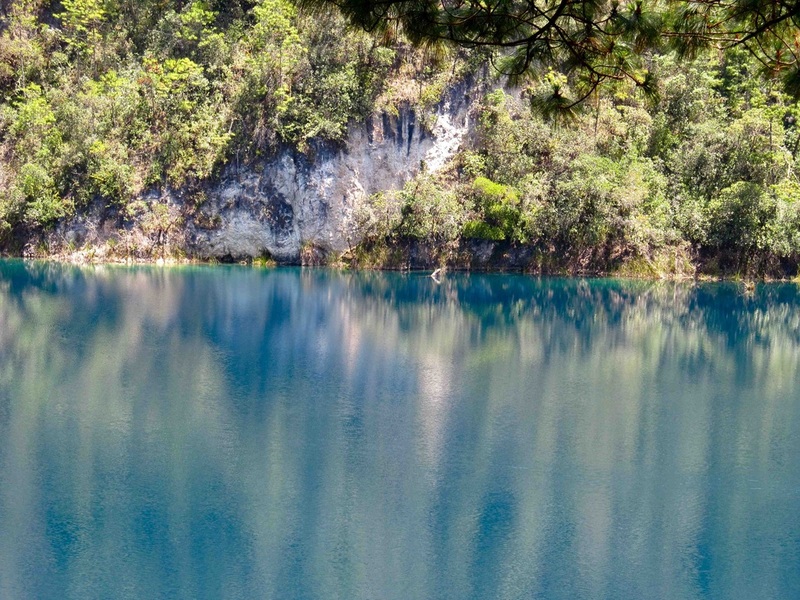 Water is everywhere, from rivers and lakes, to waterfalls and cenotes (sinkholes filled from underground springs). The most famous waterfall is Misol Há, dropping two hundred feet off a cliff, thunderous during the rainy season. Close by, but derived from an entirely different river system, is Agua Azul, a series of cascades with turquoise water. Santa Clara has two lovely falls hidden in the temperate rainforest near Toniná, found down a long dirt road and hiking trail. Palenque is the most famous of the Mayan ruins in Chiapas. It was the first to be excavated, and has an extensive collection of artifacts in its excellent on-site museum. Buildings include temples, an observatory, and tombs of various leaders. 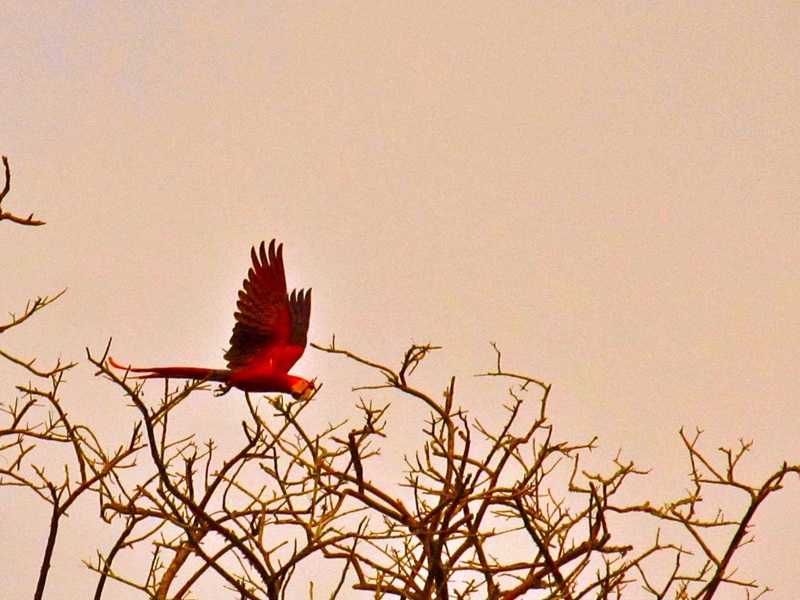 Las Guacamayas is an eco-tourism project of the Reforma Agraria Ejido, a group of indigenous people who created an ecological preserve to protect and encourage the Guacamaya, or Scarlet Macaw. 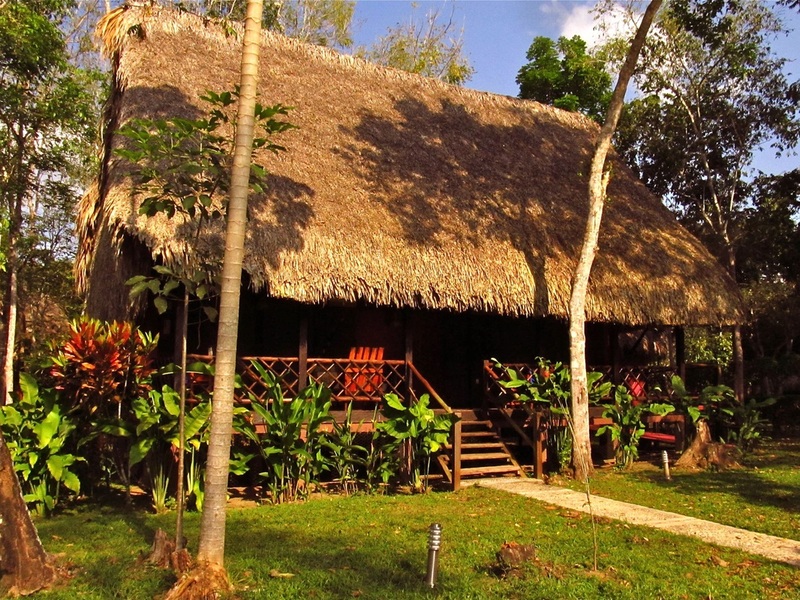 The center has comfortable hotel rooms housed in cabañas, a restaurant, and reception building where visitors can book boat rides on the Lacantún River or walking tours through the jungle. 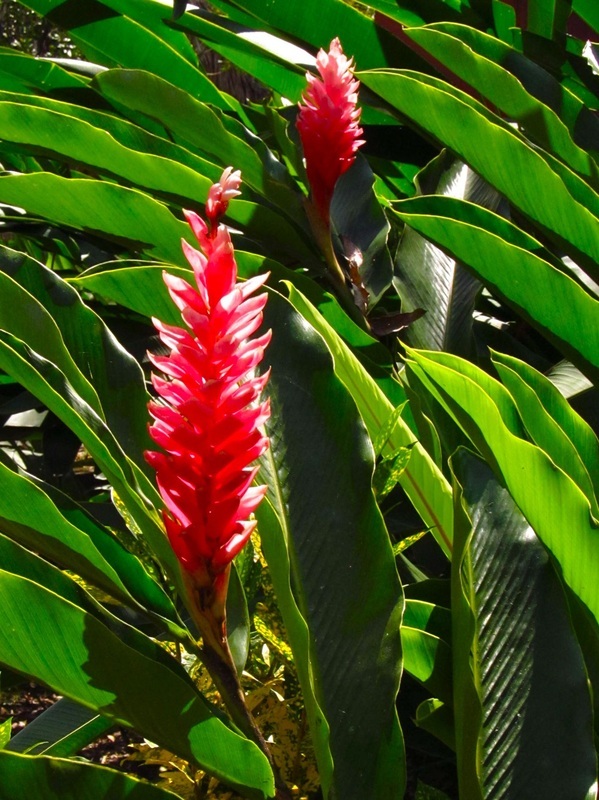 It is a bird-watcher's paradise with many varieties of parrots, eagles, and endangered birds like the Macaw and the Crested Guan.